Is there even such a thing as chocolate overload? No. But there is such a thing as a lot of chocolate, and that's what I've achieved here. 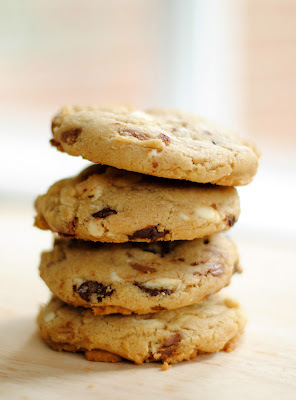 Milk, dark, and white chocolate form a holy trifecta in this classic chocolate chip cookie recipe-- one of my favourite comfort foods. You know you've made a good cookie when your boyfriend secretly stashes them away, hoarding them for himself. Yes, darling, I saw the cookies behind the sugar jar. You can't hide things in my kitchen.